I have some very sad news. My orchestral conductor here in Paris during these past few years, Serge Koussevitzky, will be leaving Paris to take a full-time conducting position in the United States starting next month.1 Fellow musicians and Parisians will mourn his departure, particularly woodwind players like myself. 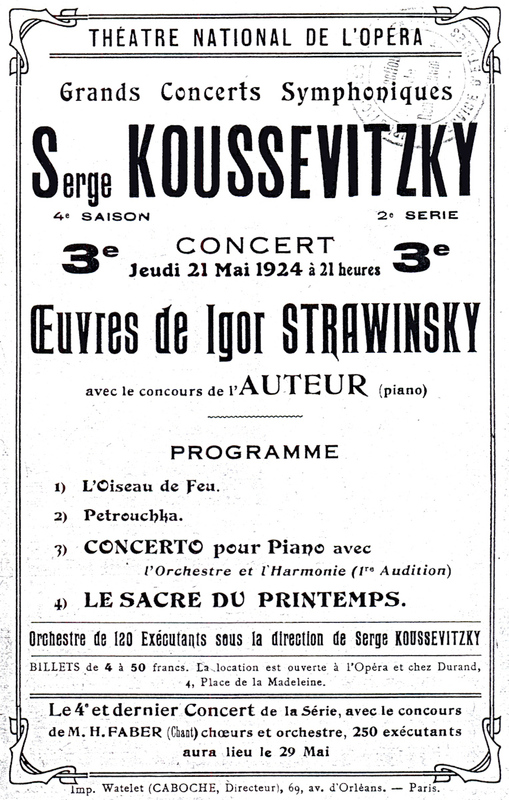 The new music premiered at Koussevitzky’s concerts is a part of a trend in French music toward musical objectivity and a focus on wind instruments, while rejecting the old Romantic style of writing primarily for strings. Koussevitzky has brought this new woodwind-oriented music to the public’s ear, changing Paris’ music scene. I have played bass clarinet in his orchestra many times during these past few years for Kousseviztky’s Paris concerts.5 His new music choices often feature woodwinds, even giving them higher precedence over the strings. Before Koussevitzky’s concert series, I didn’t have many opportunities to play bass clarinet, and I often had to find work doubling on soprano clarinet where it was needed. All-Stravinsky Concert. Théatre National de l’Opéra, Théâtre National de l’Opéra Concert Program, PDF, 1924. This past May we played an all-Stravinsky concert: The Firebird, Petrushka, his Piano Concerto, and The Rite of Spring.6 Koussevitzky programs Stravinsky’s music often, and it’s particularly profitable.7 I personally appreciate Stravinsky’s music because he has shifted important material to the winds instead of the strings in many of his pieces.8 He thinks that woodwind instruments are less emotive than strings–so they are perfect for accomplishing his goal of total objectivity in his music.9 Since many contemporary composers are taking part in this objective, anti-Romantic trend, my career as a woodwind player is going very well. At the all-Stravinsky concert, The Rite of Spring was performed as concert music for the first time in Paris, and to much success, compared to the disastrous premiere in Paris about a decade ago.10 This piece features a massive wind section as well as extensive and exciting solo parts for the bass clarinet! Solo for two bass clarinets. Igor Stravinsky, The Rite of Spring, (Moscow: Muzyka, 1965, reprint, Mineola: Dover Publications, 1989). Throughout the piece, Stavinsky takes advantage of the various strange woodwind timbres, combining them for a very modernist and anti-Romantic quality of orchestration. I was able to meet Stravinsky himself at this concert – he played his piano concerto himself, and with much virtuosity.11 I felt honored and grateful to meet a prominent composer who brings so much music to the woodwinds! Now, you may note that Koussevitzky has programmed a few Romantic-era pieces which put less emphasis on woodwind parts–so why should I be so enthusiastic about him? While we do play a classic Beethoven symphony every once in a while,17 the frenzy over Koussevitzky’s concerts is not created by programming these older works, but by the new modernist pieces by contemporary composers who put new focus on the woodwinds. Overall, Koussevitzky’s concerts in Paris have been very exciting for myself and my fellow wind players! Fortunately, while he will be working primarily in Boston from now on, he will continue to conduct occasional concerts back in Paris, in which I will gladly participate. If possible, I’d like to even travel to Boston and play in his orchestra there if I get the chance.18 Although Paris will miss Koussevitzky dearly, the music atmosphere of the city (and the opportunities for woodwind players) have been completely changed. The new emphasis on woodwinds reflects growing individuality in modern music. The French now want to assert themselves as anti-Romantic, and the unique variety of woodwind timbres are crucial for creating distance from the Romantic composers of the past. Koussevitzky is an ambassador for this new music, and his willingness to expose it creates more opportunities than ever for woodwind players like me. I can’t wait to hear from you, Claude! 1 Koussevitzky arrived in Boston on September 13, 1924. Hugo Leichtentritt, Serge Koussevitzky (Cambridge: Harvard University Press, 1947), 15. 2 Serge Koussevitzky, quoted in Raymond’s newspaper article. Allen Raymond, “New Boston Symphony Leader Hopes to Learn from Jazz,” The Atlanta Constitution (1881-1945) (Atlanta, GA), Sept. 15, 1924, 6. 3 Olin Downes, “Kussevitsky as a Magnetic Personality – Prokofieff and the Powers of Evil,” New York Times (1923-Current file) (New York, NY), June 15, 1924, 1. 5 Pigassou played bass clarinet for the Concerts Koussevitzky. Théatre National de l’Opéra, Artistes de l’Orchestre 1923 Season, PDF, 1923. 6 May 21, 1924. Théatre National de l’Opéra, Théâtre National de l’Opéra Concert Program, PDF, 1924. 7 Victor Yuzefovich and Marina Kostalevsky, “Chronicle of a Non-Friendship: Letters of Stravinsky and Koussevitzky,” The Musical Quarterly 86, no. 4 (Winter, 2002): 767. 8 Roger Nichols, The Harlequin Years: Music in Paris 1917-1929 (Berkeley: University of California Press, 2002), 51. 9 Igor Stravinsky, “Some Words About My Octet,” in Music in the Western World: A History in Documents, ed. Piero Weiss and Richard Taruskin, 2nd ed. (Belmont: Thomson, 2008), 388-390. 13 Arthur Honegger, Pacific 231 (Paris: Editions Maurice Senart, 1924). 15 October 20, 1922. Nichols, 51. 16 Michael Steinberg, “Mussorgsky: Pictures at an Exhibition,” San Francisco Symphony, last modified May, 2015. 17 “Concert Programs, Paris 1921-28,” Classical Net. Last modified December 3, 2010. 18 Pigassou played bass clarinet for the BSO in 1930-31. “A Listing of All the Musicians of the Boston Symphony Orchestra from its Founding in 1881,” Stokowski.org, accessed October 5, 2015. “A Listing of All the Musicians of the Boston Symphony Orchestra from its Founding in 1881.” Stokowski.org. Accessed October 5, 2015. 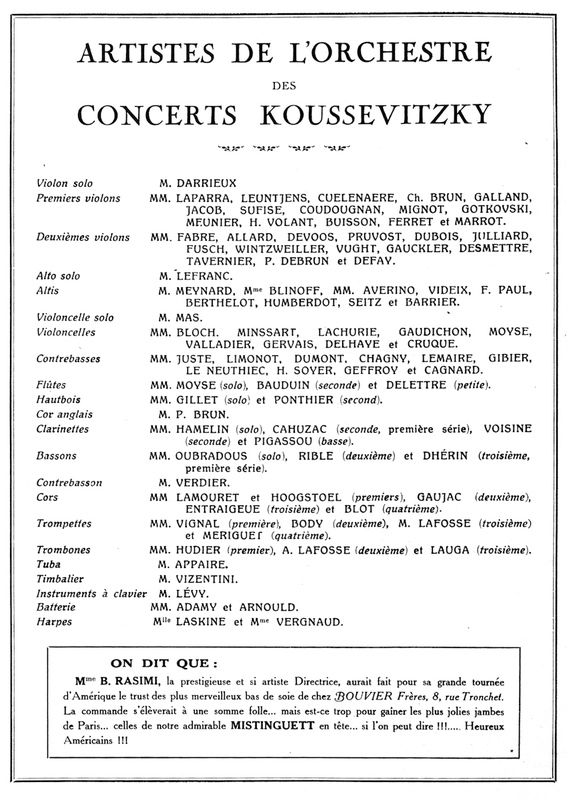 “Concert Programs, Paris 1921-28.” Classical Net. Last modified December 3, 2010. Downes, Olin. “Kussevitsky as a Magnetic Personality – Prokofieff and the Powers of Evil.” New York Times (1923-Current file) (New York, NY), June 15, 1924, 1. Honegger, Arthur. Pacific 231. Paris: Editions Maurice Senart, 1924. Leichtentritt, Hugo. Serge Koussevitzky. Cambridge: Harvard University Press, 1947. Nichols, Roger. The Harlequin Years: Music in Paris 1917-1929. Berkeley: University of California Press, 2002. Raymond, Allen. “New Boston Symphony Leader Hopes to Learn from Jazz.” The Atlanta Constitution (1881-1945) (Atlanta, GA), September 15, 1924, 6. Steinberg, Michael. “Mussorgsky: Pictures at an Exhibition.” San Francisco Symphony. Last modified May, 2015. Stravinsky, Igor. “Some Words About My Octet.” in Music in the Western World: A History in Documents. ed. Piero Weiss and Richard Taruskin, 2nd ed. Belmont: Thomson, 2008. Yuzefovich, Victor and Marina Kostalevsky. “Chronicle of a Non-Friendship: Letters of Stravinsky and Koussevitzky.” The Musical Quarterly 86, no. 4 (Winter, 2002): 750-885.